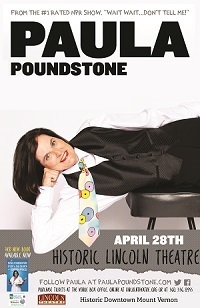 Paula Poundstone is one of our country’s pre-eminent comedians. With smart, observational humor and a spontaneous interaction with a crowd that has become the stuff of legend, she swings on stage like a Jazz musician. Without a plan. Without a net. There's a disarming ease in her craft, an immediate sense that she's so quick on her feet you need never worry about the possibility of something going wrong. Poundstone is the star of several HBO specials. Her razor sharp wit and impeccable timing makes for a perfect fit as a regular panelist on NPR’s #1 show, the weekly comedy news quiz, Wait, Wait...Don't Tell Me! Also an author, she just released her second book, The Totally Unscientific Study Of The Search For Human Happiness. Tony and Emmy Award-winner Lily Tomlin described the book as “A remarkable journey. I laughed. I cried. I got another cat.” The book landed at #1 on Amazon Best Sellers lists in Hardcover, Kindle, Audible and on the Billboard Top 10 Comedy Chart. Paula is known for never doing the same show twice. When asked about Paula, Wait, Wait host Peter Sagal replied, "Paula Poundstone is the funniest human being I have ever known. Everything she does, thinks, or says is hilarious.” Audience members often leave her shows complaining that their cheeks hurt from laughter and wondering if the random people she talks to are plants. Of course they never are. Paula is the winner of an American Comedy Award for Best Female Standup Comic and is ecognized on Comedy Central’s list of The 100 Best Standup Comics of All Time. She voiced the character “Forgetter Paula” in Disney/Pixar’s Inside Out, winner of the Academy Award for Best Animated Feature. Her commentaries appear on CBS Sunday Morning and guest appearances include Late Night with Stephen Colbert, Carson Daly, Nerdist with Chris Hardwick. She is the first woman, in its then 73rd year, to share the dais with the President and perform standup comedy at the White House Correspondents’ Dinner. She is included in innumerable lists, documentaries and literary compendiums noting influential standup comedians of our time. Advance Reserved Seating Tickets: $65 1st section; $55 2nd section; $45 3rd section; $35 4th section + applicable fees. Lincoln Theatre Members recieve a $2 discount.